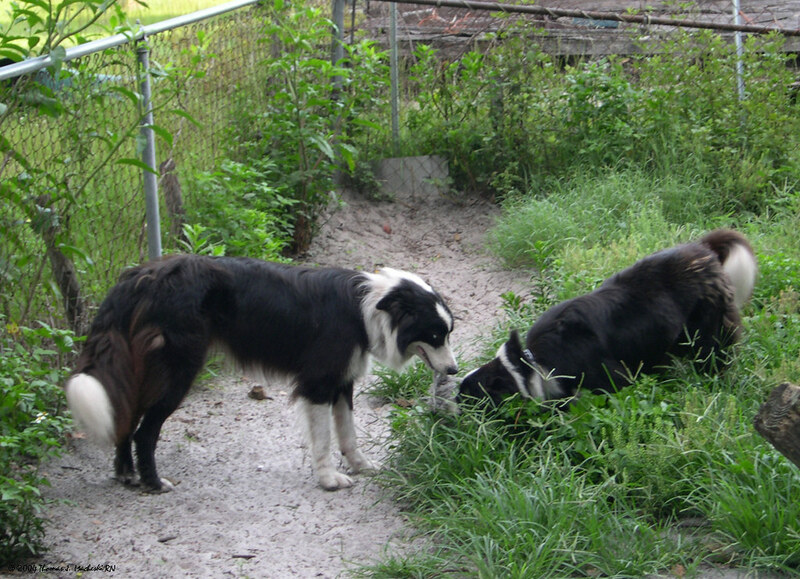 Homage to a Friend - Ramblings of Mad Shutterbug & the Border Collie Bros.
Smudge BorderCollie Bro died Wednesday week past. Whatever it was he had, he wasted away quickly. Lost a good amount of weight and his coat dry and brittle. Our second round of antibiotics, bringing him into the house and changing up his diet again to beef broth so he kept taking nourishment, he looked to be rallying. Nose got cold & moist again, breathing while at rest easier. And that Wed. morning shortly after I left for work, when Herself took him outside for his constitutional she says he 'wanted to go', and off towards the south from the house. She didn't let him as his breathing on exertion still harder than normal. When she brought him back into the house, he collapsed and died. Herself says she thinks he knew it was his time and wanted to go. Possibly, even a good probability. Or he may of scented the dead goat that was out that way; even when he was feeling poorly Smudge needed to be Doing Something. When we moved him closer to the chickens from his older spot, that helped him perk up a bit too. And while he was in the house, he'd go to the window in the bedroom and look out over them as their current mobile cages are outside our bedroom window. The portrait of him posted Wednesday 9/15, 'Sgt Smudge Sleeps' is his death-mask. Morbid as that sounds, to be doing a death-mask -- I'd been looking back through photos of the Bros and Mamma Mudge. Some of that was getting ready for a Gainesville Photography Club show, theme Nature. Domestic animals are outside that theme, but you know I had to look through all the photos to find Nature ones. And some of it was looking at the Bros while we nursed Smudge. Yes, there are far more of Houdini and Squrrl than of Smudge and nearly all of Smudge he is indeed Doing Something. Most of these photos are when he was just coming on two years old. Very difficult to get a shot of him only sitting or lying down. He did do that, of course... just not as much as his brothers. I disabled comments to the post the day he died because even the thought of a string of 'Sorry to hear of your loss' felt unbearable. Edges too raw, too sensitive just then; even the short time between helped ease that. So not this time; people need, friends need to express their feelings too, and even if he's mostly known only through my writing about him he does have friends. All the Bros do. Mamma Mudge's 'Forever Bed' (as the Bros called it in their LJ) is over near the fence/property line between our place and Ms. P's, the neighbor from whom we got Mudge. Mudge always figured she still owned Ms. P's place too, and simply expanded her home when she came to live with us. Herself couldn't think of where to place Smudge's remains. 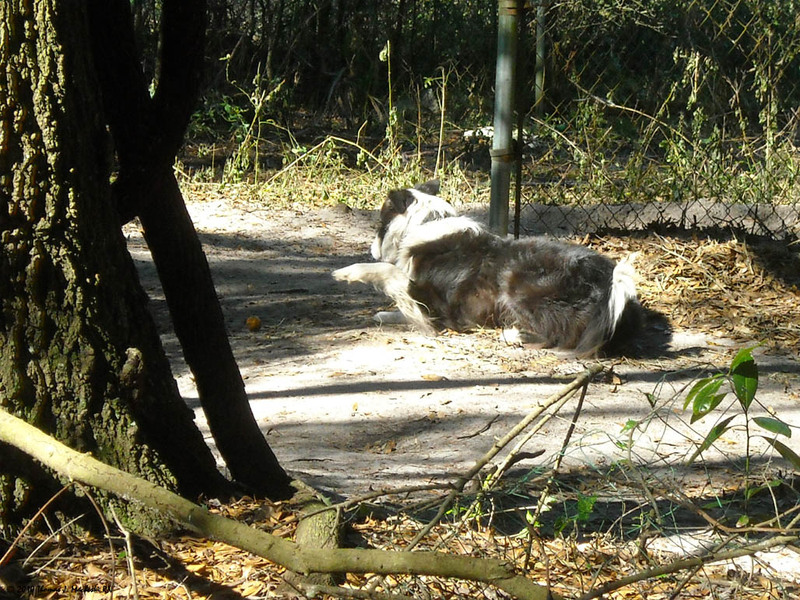 After some meditation it became obvious to me; he's out back of the House where we put their second outside kennel when they were pups. Good times, those. Good place for a Forever Bed. Our place is named after Kuma the Rottweiler, the dog we lived with when we purchased it (Rotties are herd dogs too; did you know that? I'm pretty sure you do, I've mentioned it before), KP Ranch is short for Kuma's Playpen. Years after his death (from old age) long-time neighbors would say to us someplace we'd stopped to chat that they were glad to see Kuma up by the road -- he used to sit inside the fenceline there and wait for cars to come by, then run and pace them along our property (inside the fence; he didn't go out onto the road), then sit at the other end and wait for someone coming back the other way... amongst other activities. I've certainly felt his presence a time or so, and I've more than once watched Houdini do something and think... Kuma used to do that. We're wondering if we'll experience the same thing with Smudge. Of all the Bros, he least liked going for a ride off the Ranch. Riding about the Ranch -- OK, because hey, a faster way to get to where there's Something To Do. 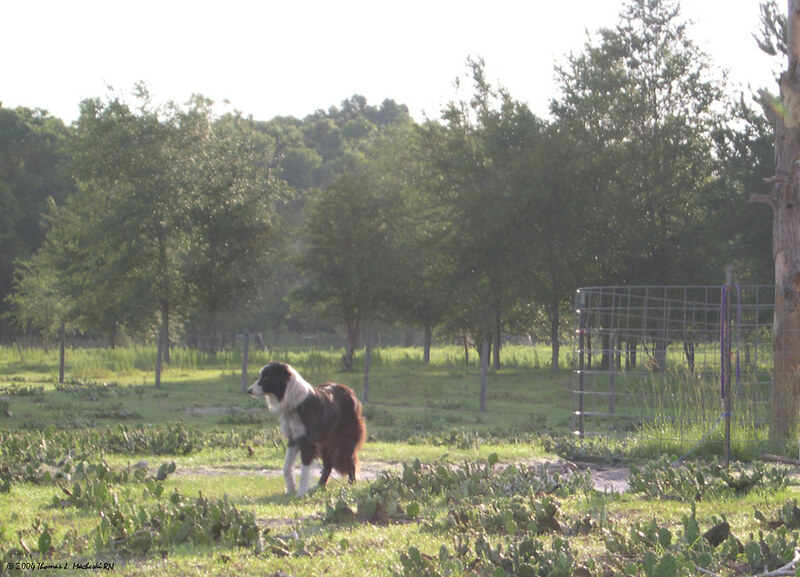 But he got very anxious the times we'd go run errands somewhere off the place, despite all the reassurance that we would be going home together, that he had a home for his entire life... he simply didn't want to be gone from the Ranch. And interesting enough my time away from the Ranch this past week and a bit felt rougher than time home, on the Ranch. As if Smudge is indeed nearby, just out of sight, keeping a nose & ear & eye on Things. Because that's what Smudgers do. I said waht I wanted to say to you in email. The sentiment stand - and those pics are lovely! Easily breached, yet we are the better for it. So sorry for your loss... and so glad for the gain of having Smudge in your life all those years. You can judge a person't depth of humanity by how much he loves his dogs. Such a beautiful tribute to a well loved, happy dog. It's awful when you have to bury a pet. I AM sorry for your loss. I know Smudge was one of the family. I'm so sorry for your loss. I only knew Smudge through the BorderCollieBros and your posts but he seemed to be an exemplary border collie. And a beautiful dog as well. I wasn't on LJ much this week, so didn't see the earlier post. RIP Smudge -- what a great dog. Just shy of eight years. 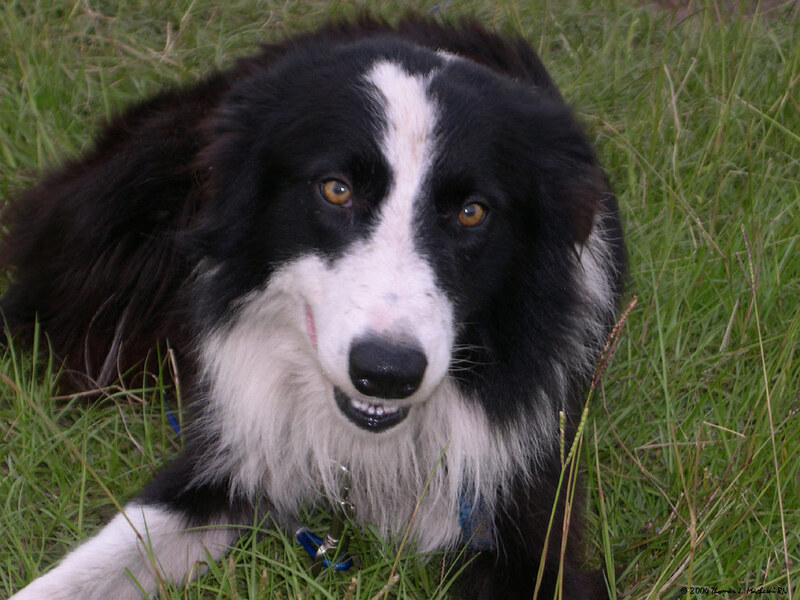 Border Collies are somewhat longer-lived as a breed, up to 15 - 16 years in some instances. I rather thought that's what the no-comments post meant. I'm sorry for your loss. Those are beautiful pictures of Smudge, and a lovely eulogy. Kind Thoughts to you, Herself, the other BorderCollieBros, and the KittenzOfTheApocalypse. I bad not known--I'm sorry. Thank you for sharing his life with us.